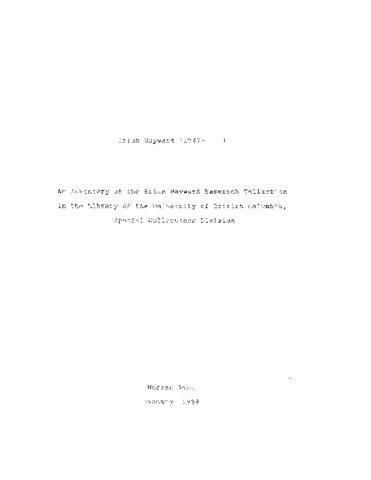 Brian Hayward was a member of a group based in the Anthropology and Sociology Department of the University of British Columbia engaged in the "Fish and Ships" project who completed a thesis on the salmon fishery in 1981. The fonds consists of notes, reports, photocopies and other material relating to the organization and aims of the United Fishermen and Allied Workers Union, 1977-78, and the "Fish and Ships" project, a group study of the B.C. fisheries industry, fishing and fish processing labour force, and fishing communities on the B.C. coast, in the overall context of a study of capital and markets, 1981-1984.